Regardless of their reasoning for avoiding an investment in ERP, there is a good chance that this technology could significantly benefit your company. Here are some important concepts to present to your boss if you are eager to streamline your processes, improve collaboration, and establish transparency. Studies on the ROI of ERP indicate that most companies appreciate a significant financial return through productivity gains, overall streamlining and centralization of technologies. While implementation can be costly, many companies are quickly able to make up the money invested towards technology selection, project planning, and training expenses. On top of this, one integrated system can save on maintenance costs, work & time. In order to convince your boss on this point, you will need the help of your colleagues as well. A lot of the time, managers or boss do not realize that so much of their workers’ time is used doing inefficient tasks that can be eliminated with a simple ERP solution. A big portion of the duty time is sometimes used for manual data entry, managing MS Word or Excel spreadsheets. Simply check out the whole daily routine chart for you and your co-workers, you can easily find out the time consuming and inefficient things that can be replaced by a simple software solution. Many times, time-saving alone can pay for the upgrade in the software solution. With an efficient ERP system in place, employees can truly focus on excellent customer service as well as on new ways to increase sales and revenue. Each process and section of your company that is integrated into your ERP can result in the increase in efficiency. Perhaps most importantly, an ERP implementation forces management to assess their existing processes and improve their workflow accordingly. In short, which helps to correct the old and inefficient system to efficient and organized process. Even though ERP is not a typical customer-facing technology, it will have a positive impact on your client relationship management system. ERP can improve your record in each of these areas which help us to find out all client history; includes emails, chat, last conversation details, purchased product details, technical support is there or not and their feedback about our service. This organized systematic approach will definitely improve the customer relationship management system. Poor data quality results in poor assessment and related problems cost organizations, billions each year. From previous year Case studies, we can find that the data quality inconsistencies can badly affect your clients, staffs, and partners. ERP implementation can reduce your need for standalone data quality processes, and eliminate errors associated with quality concerns. Work-in-progress (WIP) is not just a key concern for lean manufacturing companies. Employees can lose hours of productive time each week or day when waiting for others to finish projects or share the right data assets. ERP increases transparency facilitates project management and improves collaboration. You will be able to appreciate a remarkable reduction in expensive WIP due to significantly improved oversight of your tasks and projects. Additionally, you can eliminate the expense and time loss associated with manual data sharing with an ERP system. An ERP system is known to streamline and automate business processes. 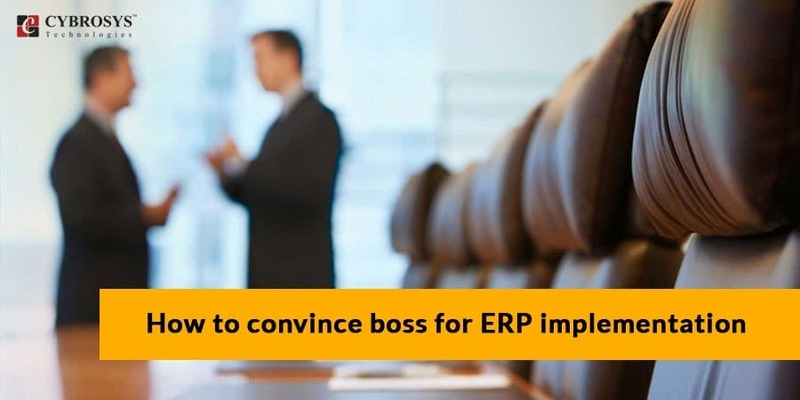 To stay in the business race, every organization need to invest in ERP to optimize inventories, anticipate customer interest and requirements, and automate processes, because it has the capability to streamline and automate processes and stay competitive. While the right IT investments typically have measurable impacts on a company, your business could appreciate a wide array of tangible and intangible benefits from ERP. Having an efficient, fully integrated ERP software system is necessary for your business because which can have a tremendous impact on the growth and success of your company. By having, accurate, visible, real-time data are readily available; you can make better decisions so you can always stay one-step ahead of your competitors. Hi there,I log on to your blogs named "How to convince boss for ERP implementation" regularly.Your writing style is witty, keep up the good work! And you can look our website about ????? ???? ?.